I guess it's time to check in on the various seedlings we've got going around the house. Some of these have been here for a really long time, and have fairly complicated back-stories by now; for others, this is the first time you get to see them. I realize that plant baby pictures aren't that much more interesting than the human variety,1 but there's some horticultural value here, in that three of the four came from seeds my regular, bought-fully-grown plants produced, so maybe this might be useful if you're wanting to grow the same plants from seeds and are curious about how long that will take, or something. 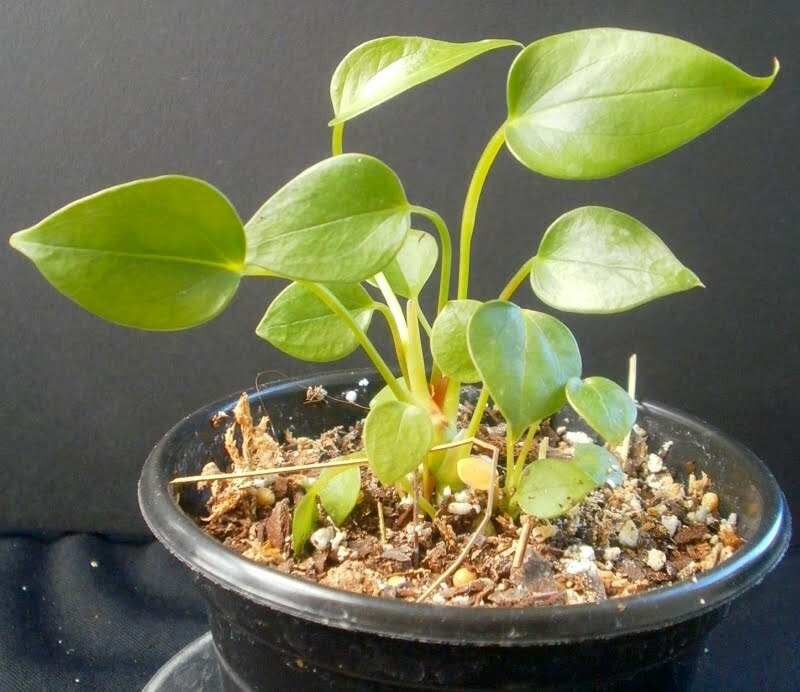 First up, let's take a look at the baby Anthurium. By now, it might actually qualify as an adolescent Anthurium;2 I first posted about it (still in seed form) in September 2009, fifteen months ago. 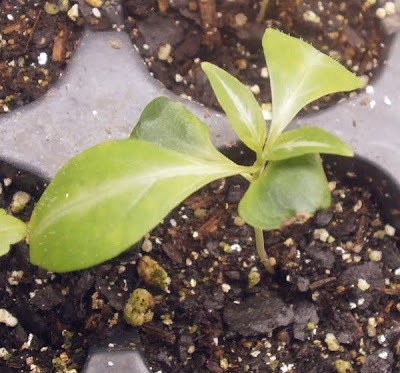 (The seeds sprouted almost immediately in damp vermiculite, began resembling plants by mid-October, had a setback last February, and began to resemble adult plants by April. I've taken some pictures since April but apparently didn't bother to make posts from them. 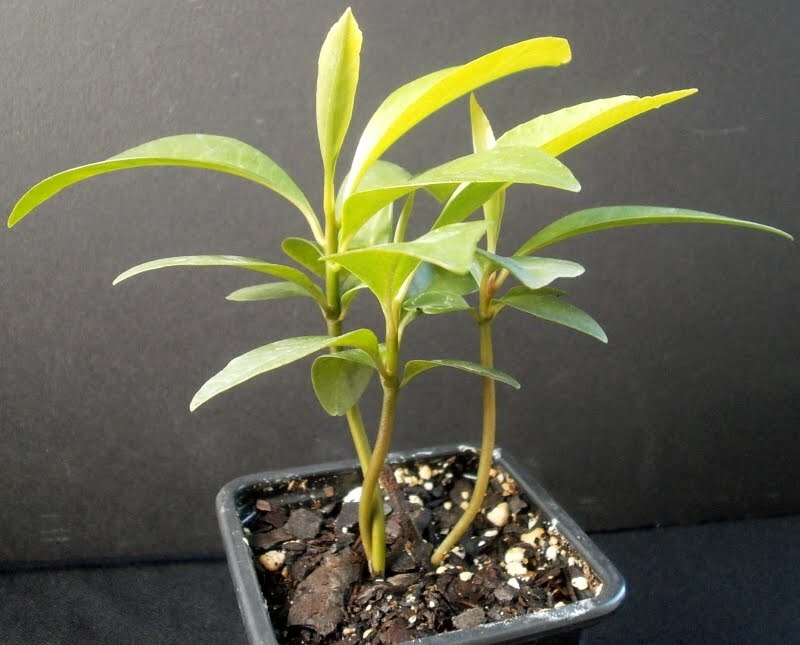 Multiple leaves per plant, enough roots to get the plant up-potted into a 4-inch (10 cm) pot, and it seems to have accepted the transition from having a plastic cover over it all the time to living out in the open just fine. I know the flowers aren't likely to be anything terribly special -- the odds favor pink, like the mother -- but I'm extremely excited to see what they look like anyway. Next up are the Abutilon seedlings, the offspring of A. 'Bella Pink' with either 'Bella Red' or 'Bella White,' I'm pretty sure. We don't need to spend a lot of time on them, because I've posted about them recently (less than a month ago), but still. For the sake of completeness. And they're all still looking good as far as I can tell, though I should probably do something about fertilizer. I haven't watered them, because they're under a plastic cover, in a plastic tray, so there's really not much of a way for water to get out in the first place, and the soil's stayed wet. Maybe an Osmocote ball in each cell with a seedling would slowly leach out some fertilizer. I suppose I should think on that. It's not as if Ardisias are particularly valuable plants; I'm beginning to see them all over the place, often very cheap,3 so there's basically zero value to home propagation. 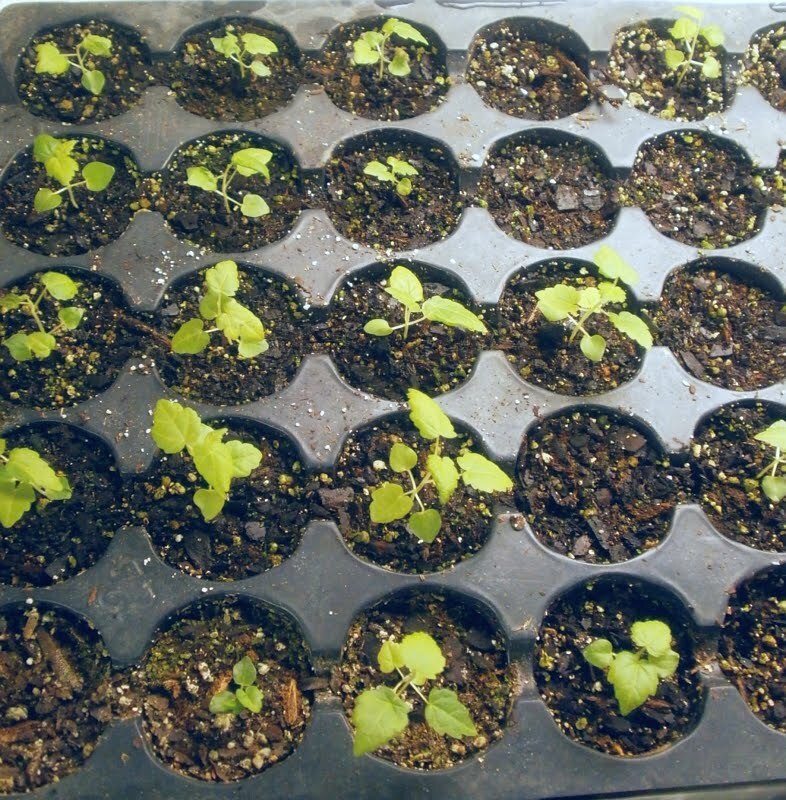 But still, I'm pleased to see that the seedlings are behaving the way seedlings ought. I've seen that basic idea -- people being happy that plants are doing what they're biologically programmed to do, what the garden center said they would do, what the plant was in fact doing when you bought it -- come up over and over again on blogs, my own and other people's, and it's an interesting little piece of psychology to me. Because of course the seed sprouted. They sprout in the wild all the time. Of course the plant produced a flower bud. How else would we get more plants? Of course the flower opened. Wasn't there one on it when you bought the thing? Didn't the tag have a picture of a flower? But of course in most of our direct personal experience, these things don't happen that often. In my world, mostly what orchids do is drop their flowers and then grow leaves for two years. I know they can grow flowers, but I only rarely get to watch it happen. In my world, the main thing crotons do is get spider mites, defoliate, and then die. So yeah, it's totally expected that flowering plants will flower, that spores treated appropriately will produce ferns, that seeds will sprout and become new plants, and so forth. But if it hasn't happened before, hey. Still an event. After the September post in which I asked for help identifying an odd succulent, which turned out to be Euphorbia leuconeura, the person who'd asked for help and I traded seeds in the mail. S/He4 sent me five seeds from the E. leuconeura, and I sent some number I forget (12? 20?) of Abutilon seeds back. Unfortunately, the mail system basically wrecked both sets of seeds (even a padded envelope is not sufficient, apparently), and the Euphorbia seeds were mostly in little pieces when they arrived. I planted them anyway, to see what would happen, and one plant did come up, but by the time it came up, I could no longer remember for sure where I'd put the Euphorbia seeds, so I wasn't sure that's what it was. It's taken a long time for any true leaves to appear, but I think that's probably what we've got here. The leaves are more or less the right shape, and the midveins on the newest pair are pretty clearly lighter in color than the rest of the leaf. So apparently one of the seeds made it through the USPS after all. It feels like the plant's been making incredibly slow progress, but it was a while after the post before I got the seeds, and the post was only three months ago, so it's actually been pretty fast, I guess. I look forward to watching it develop. I'm also trying Cyrtomium falcatum (holly fern) from spores again as of about nine months ago, but even with very good light and warmth and a sealed plastic container to keep moisture high, very little has happened so far. So there are no pictures of that. 2 I suppose I'll know when it starts telling me I just don't understand, and that it's tired of being treated like a child, and if it wants to hang out with spider mites then it's going to do it and I can't stop it. 3 They're not yet common enough for employees to know what they are or what you're supposed to do with them, but they're common enough that nearly everyone carries them. 4 I know which. The gender non-specificity is just for the sake of protecting privacy. Pretty much completely irrelevant to your post but I was looking around on e-bay at a palm store and they had 4" Pandanas utilis for 8. I realize winter is a horrible time for shipping troicals to the midwest but I do remember seeing it on your want list so I thought I'd let you know! Very interesting. I have taken an offset of Anthurium andreanum from a collegue's plant during summer two years ago. It was the size of a small seedling I guess, one or two leaves and only one root. The plantlet is now about the size of yours in the picture. By now, I want to keep it because I waited for so long to see it grow, but very often at times during the process I almost dropped it in the garbage by frustration. Are they THAT slow to grow? It was in the bottom my Anoles' terrarium, where there is enough light for any other plant to thrive. The plant itself has a very nice deep green color, just like the mother plant. So I figure it is doing well, it's just painfully slow. Do flowering size specimens grow that slowly? Yours seed to have been faster from seed, which I don't understand. Anyways I'm just puzzled and angry at the little thing. Divisions do (in my experience) seem to be slower than the seedlings have been, but then, the seedlings have also been around for nearly a year and a half, are several individuals planted together, and have been a bit pampered until fairly recently, so the differences may not be quite as big as they appear. If forced to guess, I'd guess that they're probably growing at about the same rate, it's just that divided offsets have more work to do in terms of establishing a root system, and therefore don't do as much visible growth. Oh, so I'm not the only one who has those problems with crotons. Good to know.